KC Craichy is a leading expert on Natural Health and Superfood Nutrition and will be sharing important insights about the fight against diabetes during the Reversing Diabetes World Summit that will be available online between May 5 - 16, 2014. Diabetes, Pre-Diabetes, and Metabolic Syndrome affect a billion people worldwide and almost 100 million here in the US. Many experts in fighting the disease believe that what we’re doing, as a culture, is not working. KC Craichy has been a leading voice in the fight against diabetes for more than a decade. "When you consider all the health consequences of diabetes with its cousins, pre-diabetes and metabolic syndrome, it becomes the leading disease cause of death in the US," Craichy said. Dr. Brian Mowll is Host for the Diabetes Summit. He is the founder and medical director of SweetLife™ Diabetes Health Centers, LLC in Philadelphia, PA and serves clients worldwide as The Diabetes Coach™. He is a diabetes lifestyle educator and an IFM certified Functional Medicine Practitioner (IFMCP). Dr. Mowll has been helping patients and clients address the root cause of diabetes and reverse the condition since 1998. He treats patients locally in the Philadelphia area and globally through his acclaimed Diabetes Coach™ program. Dr. Mowll invited KC Craichy and other leading experts in the field of natural diabetes care to initiate a change in the way diabetes is viewed and treated. This first online summit devoted to preventing and reversing Type 2 Diabetes begins on May 5, 2014 and runs for 12 life-changing days with 50 amazing presentations. You can get your complimentary ticket for this event simply by clicking here to register. It doesn’t cost a thing and has the potential to change or even save your life. KC Craichy, author of best-seller "Super Health 7 Golden Keys to Unlock Lifelong Vitality" and "The Super Health Diet: The Last Diet You Will Ever Need!," will be sharing exciting insights to the important role of nutrition in fighting Type 2 Diabetes. "Everyone should eat like they are a diabetic," Craichy said. "Not like diabetics eat, but like they should eat." Other speakers for "The Reversing Diabetes World Summit" include Mark Hyman MD, David Perlmutter MD, Mark Houston MD, Stephen Sinatra MD, Ron Rosedale MD, JJ Virgin CNS, Jonny Bowden PhD, Paul Jaminet PhD, Suzy Cohen RPh, Izabella Wentz PharmD, Ashley Koff RD, Stephanie Greunke RD and many more!! The information in this special online summit can change and even save lives. KC Craichy and Living Fuel are sharing this message to bring greater awareness to real, natural solutions to the diabetes epidemic. 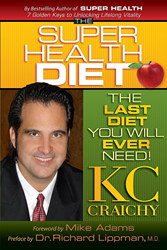 KC Craichy is a health advocate, researcher, and recognized expert on natural health and performance nutrition. His extensive study of leading-edge health research and collaborative work with top medical and nutritional practitioners and researchers to solve his wife Monica’s health problems—anxiety, depression, and suicidal thoughts—led him to the answers for Monica’s healing and to the founding of Living Fuel, Inc. As a result of overcoming this health crisis, KC and Monica have helped numerous people become overcomers in their own health situations. Together they are now cohosts of the popular Internet TV program LivingFuelTV. KC is committed to changing lives through multimedia, super health lifestyle education combined with super healthy, high impact superfoods. He is a Performance Nutrition Specialist and serves on the Nutrition Advisory Board for Titleist Performance Institute. KC also served on the Clinical Nutrition Review Board (the certifying body of the International and American Association of Clinical Nutrition) for seven years. A frequent natural health and performance nutrition guest on various TV and radio programs as well as a frequent contributor to national magazines and blogs, KC lives in Orlando, Florida, with his wife, Monica, and their five children.